If you own horses, you most likely have their best interest in mind at all times. For one thing, they’re a rather expensive animal, so you want to make sure they’re taken care of at all times and live a nice long life. However, most of us tend to think of our horses much like a lot of people think of their dogs. That’s why we take their safety so seriously. This is why it can be so hard for many people to consider using an electric fence for these animals. No matter what, horse fencing is essential. You need to keep them from running far from your property and hurting themselves. At the same time, you want to keep large predators on the other side of your property too. With an electric fence tester, you can always make sure the voltage you’re using is enough to accomplish both safely. You don’t have to worry about predators getting in, but you also won’t have to worry about your horses hurting themselves. Usually, after they make contact with it once, they’ll never want to do it again, but they won’t have any serious injuries either. 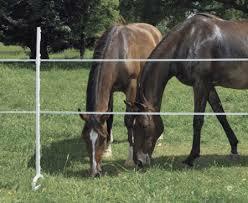 So don’t let your horses get hurt; use an electric fence for their own protection. Whether you want to build your own electric fence or you just want an electric fence charger to ensure yours is always working perfectly, you’ll love the selection of parts at Farm Supply Store.